"Berlusconi is incompetent, vain and ineffective as a modern European leader, a leader physically and politically weak leader, his often long nights at parties mean he does not rest enough." Sorry… but where the sensational revelations by Wikileaks are? I hope - from a purely intellectual point of view - that in the coming days something more original will come out. 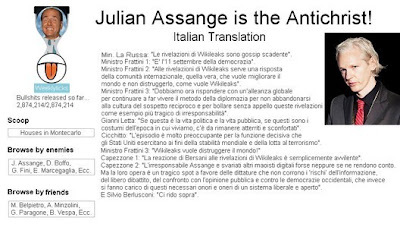 On the other hand, it is interesting to observe the reactions by Berlusconi’s politicians to the recent publications by Wikileaks. I read the considerations by Minister Frattini and La Russa, Capezzone, Gianni Letta and I also learned that Berlusconi laughs. So, exploring the web, I got yet another scoop! It seems that Silvio’s loyalists want to punish Julian Assange. Wikileaks Iraq documents: Italy soldier killed. Wikileaks Iraq secret files: Bush Berlusconi telegram. The News: Wikileaks, here are the documents.